Peterson Foods, LLC, owner of Otter’s Chicken in Marietta’s The Avenue®- West Cobb, announced today that it has purchased the Otter’s Chicken Tenders Restaurant Concept from the restaurant’s founding group and parent company. “We share the same focus on taste, quality and value as those that founded Otter’s." Peterson Foods, LLC, owner of Otter’s Chicken in Marietta’s The Avenue®- West Cobb, announced today that it has purchased the Otter’s Chicken Tenders Restaurant Concept from the restaurant’s founding group and parent company. The asset purchase agreement also terminates the existing franchise agreement between Peterson Foods and Otter’s Franchising, LLC. The purchase price was not disclosed. 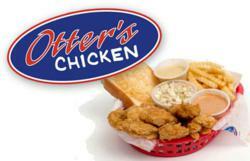 Otter’s Chicken was originally founded in Nashville, Tennessee as a fast-casual restaurant specializing in freshly prepared (not frozen) chicken tenders served in a variety of methods. Otter’s offers chicken tender meals, chicken wraps, chicken sandwiches, salads and a variety of other menu options and portion sizes, including “tailgate meals” for large parties. Its menu offerings are served in a fun and casual environment with a strong focus on local schools, their sports programs, bands and other ancillary organizations. Peterson Foods was founded in 2009 with the sole purpose of owning and operating Otter’s restaurants throughout the state of Georgia. The company now plans to increase its operational focus with an eye on regional expansion through company owned stores. Otter’s Chicken was founded in Nashville, Tennessee, by Talbott and Stuart Ottinger, Steve Logan and Charlie Fitzgerald. The first Otter’s restaurant opened in 2003, and ultimately, the concept was expanded to include locations in three states. Peterson Foods opened its first restaurant in June of 2010. “We are very excited that Peterson Foods has agreed to carry on the Otter’s Chicken concept and we look forward to their continued success in Georgia and throughout the Southeast. We approached Will and his team about this opportunity after working with them for several years as a franchisee and we are confident that they will be very successful in this endeavor,” added Ottinger.